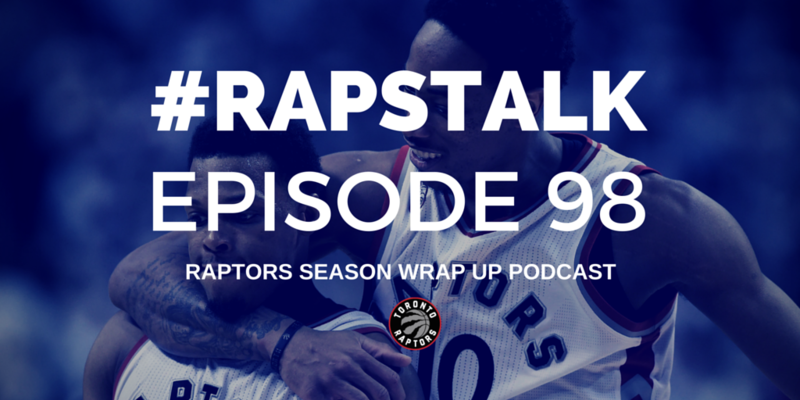 Episode 98 of RAPS TALK (05.31.2016) - 20 Playoff Games, NBA All-Star Weekend, 2 All-Stars, Jurassic Park, Eastern Conference Finals, 56 regular season wins, it was an unbelievable season for the 2015-2016 Toronto Raptors. We recap this season's playoff run and where we see this team headed in the upcoming offseason. Also, check out our sponsor to the podcast: FanEssentials.net - NBA Fan Gear delivered to your door every month. You can use the 'RAPSTALK' promo code to get 30% off your first month. 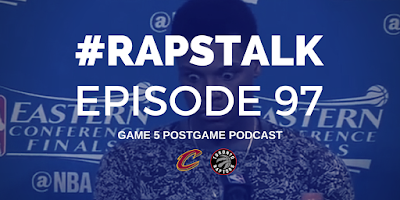 Episode 97 of RAPS TALK (05.25.2016) - CAVS 116, RAPTORS 78 Let's just forget about this one. Rip up the boxscore. The Raptors got spanked in Cleveland losing the crucial Game 5 to the Cleveland Cavaliers 116-78, and this one was over early. Lebron James, Kevin Love and Kyrie Irving combined for 71 points in the victory as the Cavs take a 3-2 series lead. Game 6 is back in Toronto, let's hope for a better result. 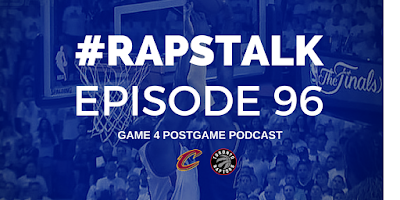 Episode 96 of RAPS TALK (05.22.2016) - RAPTORS 105, CAVS 99 The Raptors had another amazing performance in Game 4, tying up the series against Lebron James and the Cleveland Cavaliers with a 105-99 win at home. Kyle Lowry and DeMar DeRozan combined for 67 points for the Toronto Raptors in the win as the series moves back to Cleveland on Wednesday night. The Raptors are still in this! Episode 95 of RAPS TALK (05.22.2016) - RAPTORS 99, CAVS 84 This Toronto Raptors team is not getting swept. Bismack Biyombo had a record-setting 26 rebounds, DeMar DeRozan had 32 points as the Toronto Raptors had a bounce back game against Lebron James and the Cleveland Cavaliers, winning 99-84. The Raptors trail the Eastern Conference Finals series 2-1 with Game 4 in Toronto on Monday. 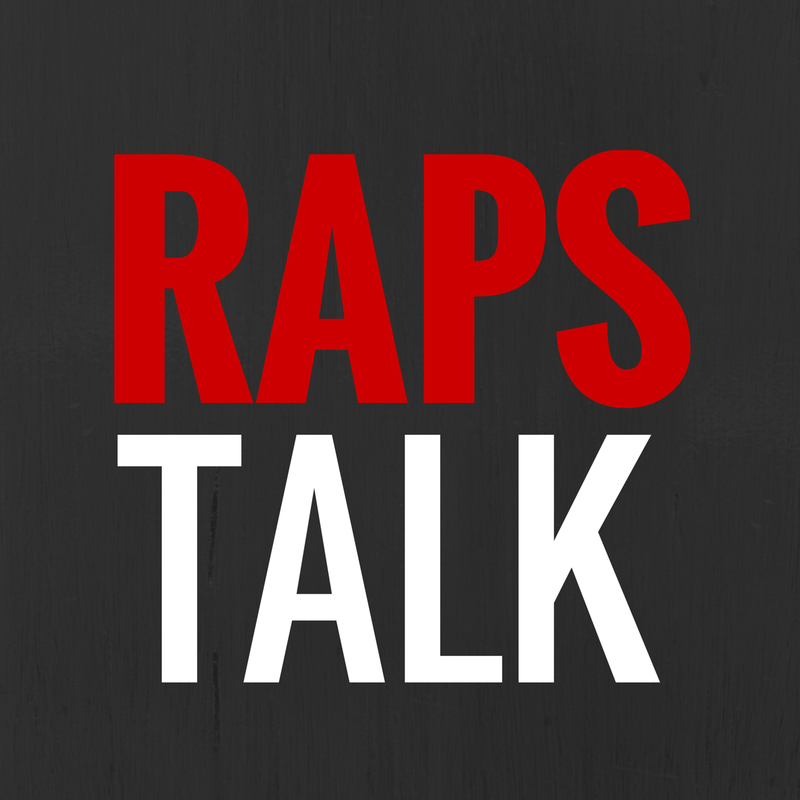 Episode 94 of RAPS TALK (05.15.2016) - RAPTORS 116, HEAT 89 This Raptors squad has made history. For the first time ever, they are headed to the Eastern Conference Finals to take on the Cleveland Cavaliers. The Raptors backcourt of Kyle Lowry and DeMar DeRozan dominated the Miami Heat to take the 116-89 Game 7 win. That was a fun game to watch. 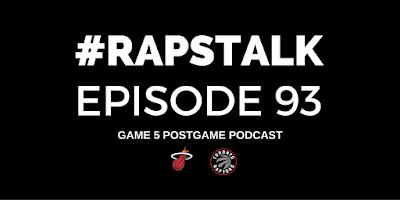 Episode 93 of RAPS TALK (05.11.2016) - RAPTORS 99, HEAT 91 It's been a roller coaster series for Toronto fans but the Raptors had another bounce back game defeating the Miami Heat 99-91 and now lead the playoff series 3-2. DeMar DeRozan and Kyle Lowry combined for 59 points, Bismack Biyombo had a monster block on Dwyane Wade and DeMarre Carroll went down with a wrist injury. It's been a crazy series with some terrible basketball but the Raptors are winning games! Episode 92 of RAPS TALK (05.07.2016) - RAPTORS 95, HEAT 91 Kyle Lowry finally made an appearance in this season's playoffs. Lowry broke out of the shooting slump and led the Raptors with 33 points in the 95-91 road victory over the Miami Heat in Game 3. Dwyane Wade finished with 38 points for the Heat but it wasn't enough to overcome Kyle Lowry down the stretch. Raptors lead the series 2-1.